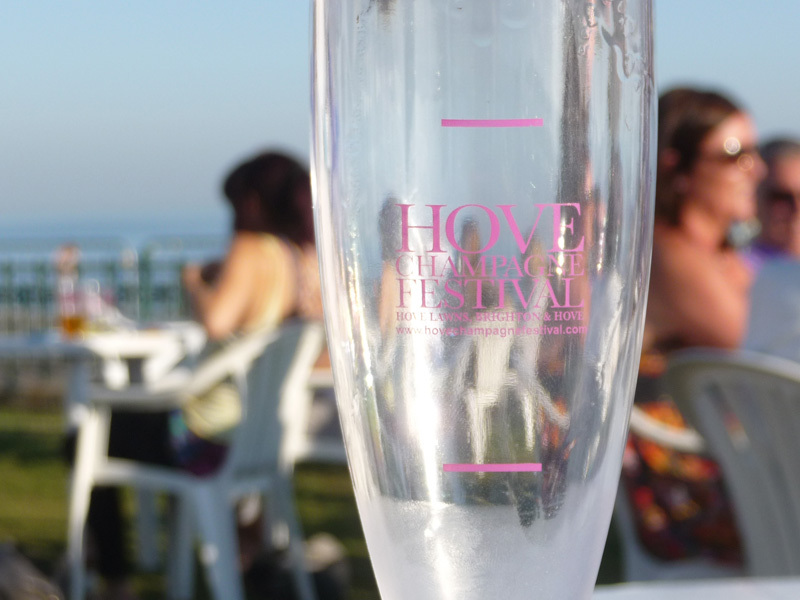 The Hove Champagne Festival could not have picked a better weekend to take place. As I popped along after a long week at work, perched myself on a table overlooking the sea, sun shining, with a glass of Roger Coulon Rosé in hand, I thought life was not so bad after all. The vast seating area was surrounded by champagne stalls, where you could claim your allocated tasters given with your ticket or purchase by the glass or bottle. Joining them was also an array of other stalls, selling anything from pearls to Polish art, which I found a bit odd really but a good opportunity for vendors to capitalise on half-cut people purchasing on a whim! The two impressive triangular tents in the centre housed the grills for two successful Brighton restaurants, Sam’s of Brighton and Riddle and Finns, where you could buy plates for around £4-6, which was blinding value for money. 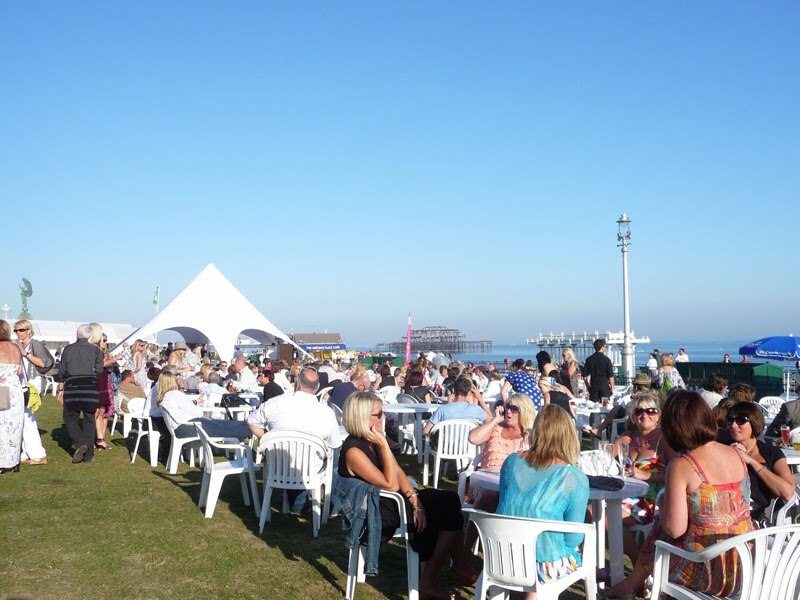 However, seafood really seemed to be the order of the day at the busy Riddle and Finns tent. Being a (beautifully designed) champagne and oyster bar anyway, they seemed right at home creating a menu to suit. It was also nice to see them creating two champagne based desserts too, just incase you weren’t drinking your fill. Knowing absolutely zilch about champagne, apart from the myth that the champagne coupe is apparently moulded on the shape of Marie Antoinette's breast, I found the tasting theatre really informative and enjoyable. I selected the session with Alex Murray, manager of Waitrose Wine Direct, who guided us through 3 champagnes versus 3 sparking wines. 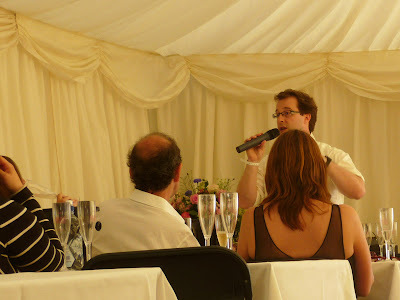 He threw in quite a few tips along the way, for instance the smaller the bubbles, the better the quality, aroma and flavour of champagne due to the refermentation stage and that flutes are better for drinking champers rather than my beloved vintage coupes due to surface area and therefore bubble retention (don’t care, I drink it quick anyway). Also the colour of the champagne is linked to the length of the pressing, the faster the press the lighter the colour. A slower press will result in the infusion of colour from the skins, giving it a deeper biscuity colour. First up was a Waitrose bestseller, SanLeo Prosecco Brut NV from the Friuli region for a mere £5.99. This is the prosecco served in Harry’s Bar for their famous bellinis, just with a different label, obviously. This was light, fresh and really excellent value for money. However, despite being Italian, I preferred the "real" champagne we were tasting it alongside! This was a Waitrose Brut Non Vintage Champagne, £20 which is made up from grapes from 30 villages. Made by Piper & Charles Heidsieck for Waitrose, it would be a good choice for a celebration party that won't break the bank. Next up was Freixenet Elyssia Gran Brut Cava NV £15, who's second fermentation occurs within the bottle, just like a Champagne. Elyssia is actually Latin for "heavenly bliss" but I wouldn’t go as far as that, preferring the gorgeous Waitrose Blanc de Blancs NV £22. This is 100% Chardonnay beauty. Totally delicious and creamy, I would happily forgo dessert and have a glass of this after dinner. My favourite of the day. We ended on an English sparkling wine, Nyetimber Classic Cuvée 2002. Nice as this was local from down the road in West Sussex using grapes from 14 year old vines and aged for 5 years in the bottle. It’s won tons of awards, so many my pen couldn’t write them all down quick enough. However, I did prefer the Waitrose Flave Curvée 2002 which is also a 100% Chardonay Blanc de Blancs. This was only aged for 3 years, but was far more fragrant. The session was a bit irritating in parts, straining to hear poor Alex over the chatter and giggles from the scores of perma-tanned blonds (weirdly dressed for the races with big hats) who were more interested in getting pissed than learning anything, but on the other hand they were there to enjoy champagne, it was a festival after all, and beats an event surrounded by a load of pretentious wine bores. I’ll raise a glass to wine education and enjoyment being for open everyone without any snottiness, just like, shut up when someone's trying to talk. Anyway, back at the festival, apart from my rather nice glass of Roger Coulon Rosé, where the skins of the black grapes are added after to infuse the white, I also tried the house champagne at Hotel Du Vin which I would have liked to tell you more about it other than it was “light, fresh and different” as the very French chap repeated to me over and over again until I gave up bothering him and went away. 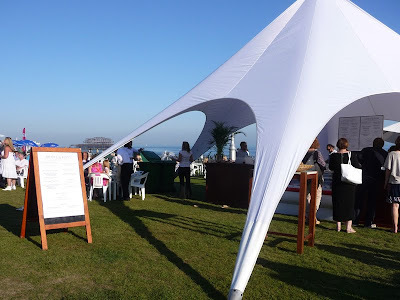 I also had a glass of Black Label Brut NV from the Lanson stall, which reminded me what type of champagne I had been drinking in the past to think I didn't enjoy it at all. So there we go. Don’t say I don’t do my research (hic). My tip off would be the Waitrose Blanc de Blancs from what I tried, but there were hundreds more to sample.